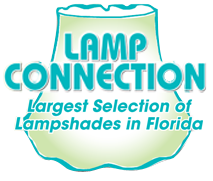 Custom Lamps to Showcase Your Style in Stuart, FL! When you want to transform a room in your home, a new lamp is a great place to start. It’s one of the most affordable changes you can make, and a small change can have a huge effect. With The Lamp Connection, the process is simple: Choose a lamp (or have one designed custom for you), choose from one of our hundreds of shades in our showroom, and the end result is a new lamp and lampshade combo that gives your room a fresh, new feel plus a twist of character. At The Lamp Connection, we’ve found that people don’t buy a lamp just to make a room brighter. Although, the primary purpose of a lamp is to provide light, this is far from all our customers’ want their new lamps to do. People want lamps as a token of their personality. The style of the lamp should match the style of the owner, and add a twist of unique style to the room where the new lamp will sit. What styles of lamp can you buy at The Lamp Connection? We carry a wide variety of styles of floor, table, and desk lamps to fit any purpose. From providing light for an entire room to concentrated work light for your desk or gentle reading light to prevent eye strain, we fit our lamps with a variety of different bulbs and shades to meet your needs, no matter how specific they may be. We also provide unique and custom-designed lamps to fit your unique personality. Come into The Lamp Connection and speak with our owner or a member of our friendly staff and discuss your vision with us. We’ll turn your vision into an illuminating reality you can match with any of our seemingly endless selection of lamp shades. We have also made lamps from saxophones, wallpaper rollers, and Grandma’s antique teapots. We’ve created custom lamps in a variety of unique shapes, including fish, birds, perfume bottles, bamboo, pineapples, seahorses, and more. Many of the custom lamps we’ve created are true one-of-a-kind masterpieces, designed and built for customers with a creative vision for the lamp that will complete a room (or multiple rooms) in their homes. You can also bring a family heirloom or other meaningful item to us and have the experts at The Lamp Connection turn it into a lamp that will provide light and fond memories forever. At The Lamp Connection, we understand that a brand-new lamp isn’t always what you’re looking for. Like all household items, lamps can break, rust, or stop looking and working like new. Whether you need a lamp repaired, repainted, restored, or retrofitted, the team at The Lamp Connection can handle any project, large or small, to get your favorite lamp working and looking like it once did. Finish the process with a new shade or elegant new finial, and you’re well on your way to a complete transformation of the room in which you put your “new” lamp. Call us at (772) 221-0222 or visit us to learn more.